New Zealand, South Pacific Ocean me ek des hae. Ii des Fiji se 3000 km aur Australia se 2500 km duur hae. Ii des me dui khaas island, (the North Island and the South Island) aur dher chhota island hae jisme se kuchh hae, Stewart Island/Rakiura aur Chatham Islands. Māori log ii des ke Aotearoa bole hae aur iske English bhasa me Land of the Long White Cloud translate karaa jawe hae. 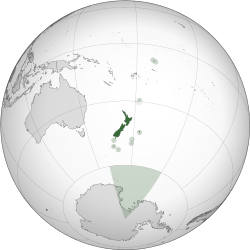 New Zealand ke niche Cook Islands, Niue, Tokelau aur Ross Dependency (Antarctica) hae. New Zealand Primary Energy Supply 2008. Performers in traditional Māori clothing. Ii panna ke 13 January 2018, ke 05:59 baje, pichhla time badla gais rahaa.